Maybe you don’t feel that you can undertake all the different aspects of a conversion yourself, but you still want the super-cool vehicle. There are plenty of companies out there that will help you get on the road. Here’s a list of conversion companies that will either sell you conversion components, do a partial conversion for you, or perform a full-on conversion using either your van or one they provide. We’ve focused on companies who have some knowledge of the overland/adventure market rather than just providing stock “RV” style conversions. Blue pins are full-on adventure conversion companies. Red pins are more traditional RV upfitters. Green pins are component suppliers. Be aware that some of these companies are really popular and may have long waiting lists. It’s not unusual to have to wait a year to even get a build slot with the bigger and more popular outfits. Adventure Wagon sell full conversions and conversion components. They also rent vans so you can try before you buy. Tualatin, Oregon. Boulder Offroad have lots of photos of Chevy/GMC 4×4 trucks on their homepage, but apparently they also do Sprinter related work. Lafayette, Colorado. CaveVan was started by Cole, a forum member. He sells van hammocks as well as doing conversion work. Colorado. CampoVans have just started in the conversion business after making two vans for their own use. More utilitarian than some, but highly practical. Check out the 4×4 video they made! Santa Barbara, California. Colorado Campervan make pop-tops for regular height Sprinter vans so that you can get your Westie on. They also provide seating, beds and interior cabinetry. Loveland, Colorado. Craftsman Vans – a smaller builder. Salt Lake City, Utah and Portland, Oregon. Freedom Vans have pictures of several adventure vans they have converted. Bellingham, Washington. Mobius Concepts will provide any level of upfit from basic walls and floor to full cabinetry. Designed with outdoor/climbing folks in mind. Here’s a review. Denver, Colorado. Morehead design lab is a small business. In 2015 the original owner, Robert Morehead, sold the business to Thomas Coffee. Mixed reviews. I have to say, if the work they do now on vans is as bad as the work done on organizing their web site, you might want to think twice. Asheville, North Carolina. Nomad Vanz are making outdoorsy conversions with lots of well thought out luxuries. Vancouver, British Columbia. NorthWest European Vanworks will fix your van or help you build it out as a custom adventure vehicle. They also host the annual Vanapalooza meetup. Bellingham, Washington. Oak Tree Vans upfit many types of vehicle and trailer for commercial use as well as both regular and adventure RVing. Escondido, California. Opt Overland will do custom outfitting build work. Specializing in off-road camper van conversions. They are building their own pop-top design. They also have a rental fleet of Quigley equipped Fords. Outside Van used to sell and install components and do partial conversions. They’ve become so popular that now you can only get a full build from them. Trendy, trying to be “lifestyle” focused. Basic, semi-custom, or full custom builds are possible. Prices start at $40k (plus the van) and go as high as you dare. Portland, Oregon. Overland Explorer convert Sprinter chassis along with making trailers and flat bed campers for adventure travel. Red Deer, Alberta, Canada. RB Components produce and sell a lot of pieces that you can use for a conversion. They will also install those pieces, or do a whole build to your specifications. Santa Fe Springs, California. Sportsmobile specialize in custom and semi-custom Sprinter van conversions. They have a reputation for creating adventure vehicles on the old Ford Econoline /E350 platform. Their cabinetry still looks very old-school, but they are improving on that front. Fresno, California; Austin, Texas; Huntingdon, Illinois. TouRig will upfit an entire van. The work on their site looks nice. Golden, Colorado. Upscale Automotive sell suspension and engine related conversion components and aftermarket additions. Tualatin, Oregon. Van Haus do some nice looking conversion work on many types of van, including Sprinters. They will do everything from a single fan installation through to an entire build. Vancouver, Washington. Van Specialties Sell the parts you need for a conversion. They will also install those parts, or do a whole build to your specifications. Tualatin, Oregon. VanCo of Northern California mostly seem to do trade van upfits, but will do window, fan, and other component installs too. Sacramento, California. Vanworks (and Rocky Mountain Truckworks) make an interesting camper package. Fort Collins, Colorado. This Moving House created a family surf van from an extended length 170 Sprinter. It got a lot of interest because of the novel 4-person sleeping arrangement, so now Jack will build you your own version. Oxford, UK. Some RV manufacturers now make vehicles that are more overland/adventure oriented than the typical RV, but still have the base feel and styling of an RV. Advanced RV makes RV style vehicles with high-end interiors that are still relatively adventure-worthy. Willoughby, Ohio. Creative Mobile Interiors do many types of conversion, including what they call adventure builds. They don’t appear to be adventure specialists though. Grove City, Ohio. Exclusive Motors look like a dealership because they are a dealership. They also do conversions, mainly using bolt-on parts by the looks of things. Placentia, California. GTRV specialize in pop-top van conversions. Because they use words like “dinette” we’ve put them in this category, but they could probably build an adventure-worthy vehicle. Also converting Metris chassis vehicles now. Sebastopol, California. Midwest Automotive Designs are a Mercedes Master Upfitter. Their vans are more luxury than adventure, but worth a mention. Elkhart, Indiana. New Image Vans have images on their site that look a little “old school” but they will also cut 3-person benches down to 2-person size! Salt Lake City, Utah. Oregon Motor Coach Center don’t specialize in adventure builds, but list them as one of their options. Portland and Eugene, Oregon. The Winnebago Travato is a good intermediate step between RVs and adventure vans. It’s built on the Dodge platform. Although it has a more traditional RV layout that has less interior storage space for toys, it’s still designed with outdoorsy people in mind. For instance, it has a solar panel on the roof rack and a bike rack on the back. Don’t necessarily expect these vehicles to perform well off paved roads though. A friend of ours owns a Travato. He said he felt like the whole interior of the vehicle was going to shake apart when he took it on a short section of gravel road. He is also having issues with the particleboard cabinets falling apart. Update 9/2017: Winnebago announced their Revel van. It’s built on a 4×4 Sprinter chassis. Pricing starts at $140k. It has some nice features, but I sure hope the build quality is better than the Travato. There are some interesting features like a bed that disappears into the ceiling. There are also some elements that Winnebago still doesn’t “get” – like throwing roof racks up that shade their solar panels. It has all the gloss and shine of an off-road capable RV. We need some more owner reports before we can be sure. Some companies realize they do one thing well, so they stick to just doing that. If you want help with certain parts of your install, you might want to use these specialist vendors. Adventure Wagon make some interesting overhead storage compartments that fold flat when not in use, and a really cool modular bed system. Tualatin, Oregon. AM Solar does what they say: solar-based electrical installations. They’ve recently started selling DIY kits that use Victron components. They will also do a full install for you. Springfield, Oregon. Campway‘s is a California-based chain who appear to be more truck than van focused, but they will do window installs and other similar work. Santa Rosa, Sacramento, Martinez, Hayward and San Jose California. Impact Inc. is run by Hein and Kim, who are pretty much the only people you can buy 3M Thinsulate automotive insulation from. Despite having a virtual monopoly, they are nice people with a fair price for the product. They also sell various other helpful conversion products like solar panel brackets, speaker adapter rings for the doors, and so on. Hood River, Oregon. Panther RV sell SMEV sinks and stoves, Vitrifrigo fridges, and Fiamma awnings. They are suppliers to many of the Portland-area upfitters like Outside Van. They carry more Fiamma awnings in stock than most companies, and they ship nationwide. Washougal, Washington. 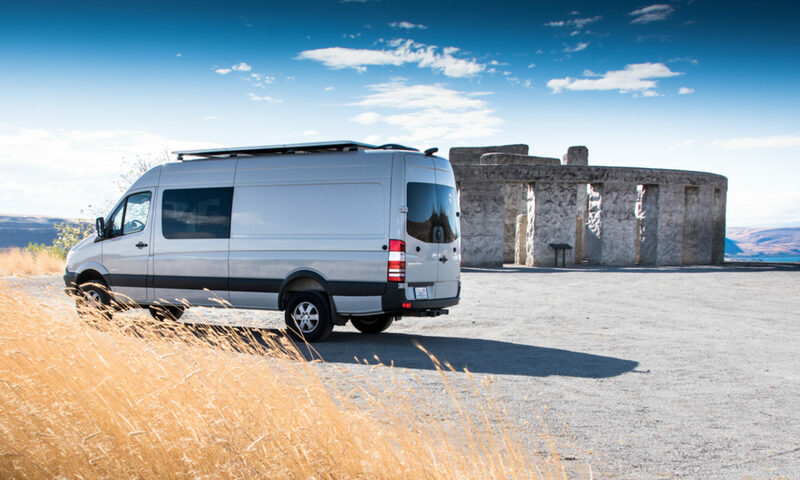 Van Compass sell suspension components and lift kits for all Sprinter models. Post Falls, Idaho. Whitefeather does Sprinter 4×4 conversions using Ford drivetrain parts. The conversion creates a more off-road capable vehicle than the factory 4×4, but it creates a Frankenvehicle. It’s also not cheap. Some people on the forum have been happy with theirs, others have been unhappy. Red Bluff, California. Don’t imagine that all of these companies are the same. Don’t think that paying more money gives you more quality. Do NOT fall in to the trap of thinking that a brand name company necessarily has more skill or provides more value. Do your due diligence. It’s probably best to work with a company close to where you live. Arrange a time to go and visit them. Check out the builds they have in progress. Ask for some references for previous customers, and ask those folks questions. Ask questions about the company on the Sprinter forum. When you talk to the company, get a feel for how flexible they are. Lots of the companies have set ways they want to do things. They have tried and tested components from particular suppliers. That doesn’t mean it’s the best way or the only way. It just means they haven’t had too many customer complaints. Before you contact these companies, it’s still worth reading through what’s involved in a conversion. That’s because if you don’t know what you want when you talk to them, it’s unlikely you’ll end up satisfied with what they produce for you. If you do know what you want, and they try to talk you out of it, ask yourself why. Is it because they have plenty of experience using a van in the same way you want to, and can give you good reasons why your ideas won’t work? Or is it because it’s hassle for them to do things differently? For instance, if a company is used to installing propane, but you’ve decided you want an all-electric van, are they excited to dive into a lithium battery install, or do they tell you it’s a crazy idea? Do they back that up with examples? For some companies, it’s just not worth their while straying from their tried and tested suppliers, even if the technology they’re using is out of date or sub-par. That’s fine. There are plenty of other people who are OK with paying big money for sub-par equipment. You don’t have to be that person. We’d like to make this list as comprehensive as possible. If you know of a conversion company that should be listed here, let us know and we’ll add it. If you’ve used one, let us know how it went.